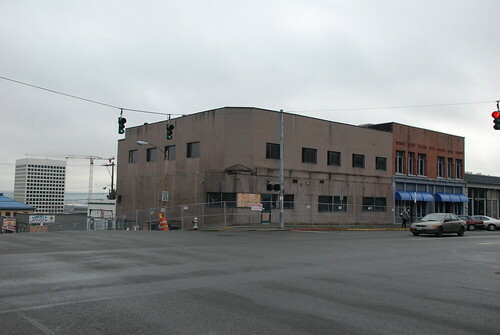 The blighted corner of South 11th & Tacoma Ave is set for renewal. The fence is up and the demo crew is busy. I don't suppose we could get another Kelly's could we? by intacoma on 12/8/2008 @ 5:49pm I thought this was already talked about, isn't it going to be filled up with attorneys? by fredo on 12/8/2008 @ 8:11pm intacomas right. Attorney Patrick Palace planned to make this place his office but subsequently sold it to another attorney. by NineInchNachos on 12/8/2008 @ 8:16pm Always get the creeps from this place on route to the library. will be nice to see it filled in. by Dave_L on 1/28/2009 @ 10:19am Ick, new white vinyl windows are being installed. It looks like they have kept more to the original window layout, and I'm glad the stucco is removed, but at this point the windows are screaming white vinyl on the north and east sides. I heard the library''s Northwest Room just discovered a previously-unknown early photo of the building, and I wish the remodel would more closely respect the original materials and design. But I couldn't buy the building so I can only whine. by fredo on 1/28/2009 @ 10:48am Dave, can you put up a picture? by Dave_L on 1/28/2009 @ 11:18am Sorry, I didn�t take a photo of the new windows. When you come up 11th you can see them on the east (downhill/alley) side, where the rear balconies are. The north and west sides have a construction curtains installed and it�s hard to see. If you mean the newly-discovered old photo, it�s not yet on the library�s on-line database. I�ll see it�s available to look at next time I go to the Northwest Room. The Northwest Room and its staff have got to be one of Tacoma�s greatest assets. by Erik on 1/28/2009 @ 11:21am Always get the creeps from this place on route to the library. will be nice to see it filled in. Right in the middle of downtown, this building was blight central and an embarrassment. Perhaps Tacoma Ave can be a place people choose to go one day rather than just the criminal justice center of the county. by fredo on 1/28/2009 @ 12:30pm Thanks Dave, I meant the windows you were describing. Nothing screams "place where undesirable people congregate" more loudly than a row of bail bond companies. But we do need these businesses to service a very real need. Good call Erik. by Dave_L on 1/28/2009 @ 8:42pm I may have criticized too soon - I'm hoping the white color on the windows is just a factory primer. It's hard to get a good look at them. Regardless, they are using a double-hung look, so that's good. The historic photo, part of a larger Boland panorama, shows about ten tall, narrow windows along the upper floor in front and a decorative mansard and I think a medallion at the chamfered corner. A weird balcony-type extension or signage and the ubiquitous fabric awnings at the street level. Very intersting. An Morgan, about your article about lopped-off buildings, the photo shows that the brick building just to the south of it (1109? on the Historic Register, I think) had two more floors with arched-top windows on the upper floor. by Maria on 1/28/2009 @ 11:39pm There's supposed to be a restaurant or deli going in on the bottom floor. I can't remember the name, it was some pun on "bar" I believe. by Maria on 1/29/2009 @ 12:01pm Here's the story from the News Tribune. I can't find it on their site though, so this is a link to Google cache. The cafe: Tom Irick, owner of Hot Rod Dog on lower Pacific Avenue, will open SideBar Bistro with his wife, JoAnna. The eatery will feature, Irick says, gourmet sandwiches, soups and salads, as well as microbrews, a worldwide selection of wine, and drinks. �But it won�t be a hip martini bar,� Irick says. For d�cor, expect a look at Old Tacoma in black-and-white, with photos of prominent attorneys and judges from over the decades. by Altered Chords on 1/29/2009 @ 12:17pm That sounds great. They will almost certainly want a classic jazz quartet to play there from time to time. Perhaps among the pictures of prominent attorneys and judges they will have a few pictures of that prominent Tacoma bass player "Red" Kelley? By the way. Gourmet sandwiches? Tacomans love sandwiches. I do not think anyone can make a pastrami sandwich better than the one I make. I don't care who they are or what restaurant they operate or where they went to culinary school. by Altered Chords on 1/29/2009 @ 2:05pm 11th street rag...I'll ask Kevin if he know it (trumpet player). Maybe Jamie from Thrice All American knows it?